After a relaxing night’s sleep in one of our comfortable rooms, your day begins with an amazing meal. A full gourmet breakfast is included with your stay and will be a highlight of your visit. 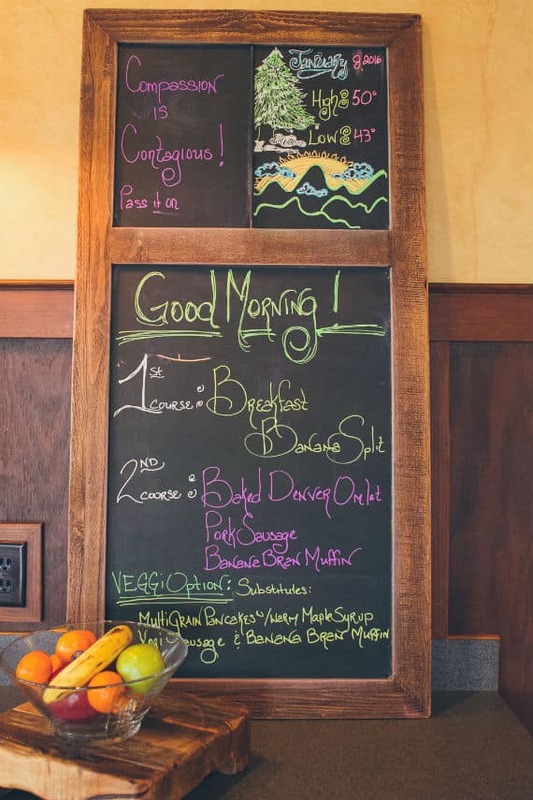 We use fresh ingredients that we source from local farms, farmer’s markets, or picked fresh from our own kitchen garden when seasonally available. A typical breakfast has two courses and starts with a sweet dish, like Creme Brulee French Toast or Fresh Berries with Fat Free Greek Yogurt. For the main course we serve hearty egg dishes like Eggs Florentine, or a hearty Baked Denver Omelette. And we always serve delicious breakfast meats, like thick-sliced Applewood Smoked Bacon or Vermont Maple Sausage Links. Along with the main course, we also serve breakfast breads. 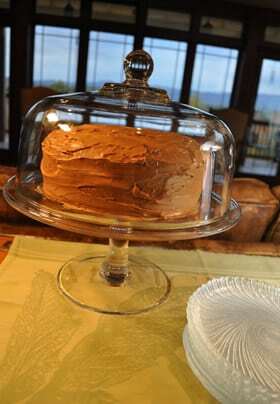 We love baking them, and they are freshly prepared in-house every day. Waking to the aroma of fresh baked Morning Glory Muffins or Apple Walnut Bread is a great way to start your day. Not only will you enjoy the food, but the view will also make your breakfast memorable. Our dining room has a wall of windows that provide magnificent views of near and distant mountain ridges and a view that stretches for miles across the Sautee Valley in North Georgia. Outdoor dining on the back porch is available with the same gorgeous views, weather permitting. 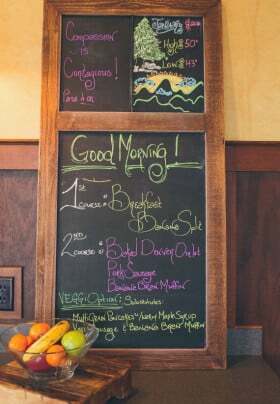 Breakfast is served daily 8:30 AM – 10:00 AM. Coffee and a variety of teas are available throughout the day and for those up early to watch the sunrise over Lynch Mountain. Enjoy our delicious breakfast and desserts before and after your adventures during your stay at Lucille’s Mountain Top Inn & Spa. Lucille’s Mountain Top Inn & Spa serves a wide selection of wines and champagne available by the glass or bottle. We’ve selected some of our favorite regional wines for you to enjoy, along with a variety of domestic and international wines and French Champagnes. Relax on the Inn’s back deck while you enjoy a crisp New Zealand Sauvignon Blanc, a local Chardonnay or an Oregan Pinot Gris. 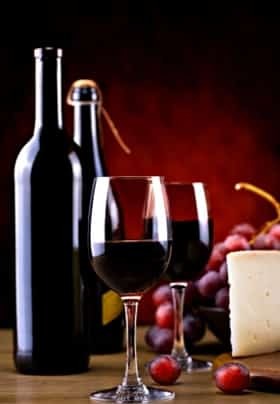 Or perhaps you would like to savor the rich taste of a California Cabernet Sauvignon or local Georgia Cabernet Franc. You are sure to find several wines to suit your taste buds. If it is truly a special occasion ask to have a bottle of champagne on ice waiting in your room for your arrival. Lucille’s Mountain Top Inn & Spa also offers a wide variety of craft beer styles for the beer connoisseur. We are currently serving a variety of craft beers from several different Georgia breweries, along with quite a few others. The selection changes frequently but we always have something for everyone who enjoys craft beers. White County, Georgia Ordinances, Section 6-54(d), specifically prohibit “brown bagging” at inns. 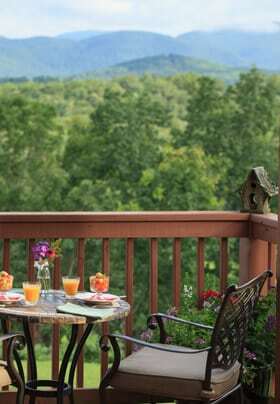 No outside alcoholic beverages can be served or consumed in any public area of the inn or spa, including the deck, back porch, dining room or living room. Only wine and beer sold by by Lucille’s Mountain Top Inn & Spa can be served or consumed in any public areas of the property. We actually wish this was not the law – it’s would be fine with us for you to bring your own favorites – but since we want to keep our license, we have to enforce it. Our stay at Lucille’s was FANTASTIC!! The room, mountain scenery, breakfast and the staff made our visit special! Everything was Top Shelf!